So begins Camilla Lacely’s charming, witty diary of life as a vicar’s wife in a mid-sized town outside of Manchester in the anxious, early days of World War II. The ‘everything and nothing’ that happens include a controversy swirling around the curate’s pacifist sermon (through which, alas, Camilla napped, making it difficult for her to discuss with outraged parishioners), servant problems, anxieties about Camilla’s son off training with his regiment, the day-to-day worries of friends, and a potential romance in the town … or are there two romances? 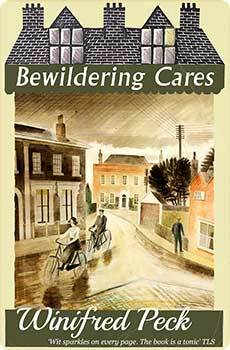 Readers of Bewildering Cares might well be reminded of the likes of E.M. Delafield or Angela Thirkell, but Peck offers her own distinct take—sometimes hilarious, sometimes touching—on the ironies and heartbreaks (not to mention the storms in teacups) of domestic life, community, faith and life during wartime. This new edition includes an introduction by social historian Elizabeth Crawford.